"Helen Marie Stone, Westbrook College, Class of 1978"
Westbrook College student Helen Marie Stone, Class of 1978, was a Legal Secretary major and a Day Hop. 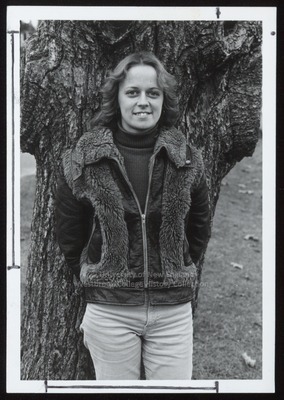 For her senior class candid photo, which appeared in the 1978 Tower Yearbook, she wore light-colored jeans, a dark turtle neck sweater, and a leather and fur jacket with front zipper. Her hair was parted in the middle and cut in a shag that hung down to her shoulders. Helen Marie stands in front of a large tree trunk.